I’m so confident in my pick for what 2011 will be about that I’m publishing it before Thanksgiving Holiday in the States. Before we begin let’s take a look at the history of my predictions. Take a moment to make one yourself. Head over to my new favorite website http://qrcode.kaywa.com/ where you can enter a link, text, a phone number, or text message and click generate. In an instant you’ll have yourself a fantastic looking square. Now what do you do with it? That’s up to you. I like to right-click on the picture and choose “Save Image As” and download the .png file. Now that it’s an image you can: put it in a document, print it off, or put it on a website. Anything you can do with an image you can now do with this information. Next you need something to read the QR Code with: For your Desktop download this one (Windows, Linux, Mac): http://bit.ly/bRLO3C For iPhone, iPod (need a camera) users: i-nigma is my favorite at the moment and they have readers for basically all devices that have a camera now. For Android users: QuickMark is a good choice There are hunders of them out there now….search and find one for your phone/platform that you can live with and you’re ready to go. Well let’s have at think about this. One thing the book industry has been having a hard time with is creating a social feeling around the old medium. How do I find other people who have read the same book that I’ve read and discuss the topics with them? I’m just finishing reading I Live in the Future and Here’s How It Works by Nick Bilton (more on that later) where Nick puts a QR Code at the beginning of every chapter. As you read a chapter you can scan the barcode with your phone or computer and be taken to a website where you can get up to date information, research that didn’t make the book, and comments from other readers who read the same section as you did. David Warlick in his new book A Gardner’s Approach to Learning takes full advantage of QR Codes as well. I only wish I would have been more forward thinking in my own book…but hey I completed it and that was enough for book number one! The airline industry is taking full advantage of these little devices and I’m loving it. I haven’t owned a printer in…gee….10 years plus at this point. So checking in early online for flights still means I have to stand in line at the airport because I can’t actually print my boarding pass. Not anymore! More and more airlines and airports are moving to QR Codes as boarding passes. American Airlines, Delta, Malaysian Airways, ThaiAirways are ones that I have first hand knowledge with and I’m sure there are more out there and more coming. I now check in online and the airline sends me a link that I click on that loads the QR Code. I swipe it at the gate and off I go! A teacher puts a QR Code on everything in the classroom that gives its name in French and students can read the codes with their phones to study the names of items. A fun and engaging way to learn? Put a QR Code on all the bones on the skeleton in the corner. Kids scan the code it gives them the name of the bone and then links to the wikipedia article that talks about that bone specifically. Students scan a code and the class iPod. It gives them a message and they are thrown into a inquiry based investigation about water. The code tells them to start at the water fountain. When they arrive they find another QR Code that gives them a link to a website that has directions and information to complete a task using the water from the water fountain. Once that task is complete they scan another code that opens up the Maps App on their iPod and puts a dot on where they need to walk next. Using their map skills they learned in 3rd grade they navigate to the next spot which happens to be a tree on the playground. There they find a QR code taped to the tree. They scan it and their next mission is given to them…..etc. OK Librarians you’ve gotta love this one. Create a QR code that connects to Amazon reviews of the book. So kids can find a book, scan the code and it takes them to the reviews of that book so they can see what others have said about it. Or here’s even a way cooler option. What if you have students create reviews for books they read, you upload them to the school library site and then create a QR code that links to that student review from in your school. How cool would that be that kids would be actually writing reviews for other kids in your school about books! Please leave your ideas on how you could use these amazing little codes in the comments or links to other examples of how they are already being used in schools. Then print off the QR Code and just put it on a bulletin board somewhere in the school. No explanation, no directions, just put it there and see what happens. So…I’ve done the same. To the left is a picture of a bulletin board in the high school that gets a lot of traffic (every student takes English) so I’ve put it on the board and we’ll see what happens. I printed it off on Thursday and so far no takers. Do one yourself and let me know what happens and how long it takes. I’ve also printed one off for the middle school and will get the 5th graders their own on Monday. I’m really interested in seeing what grade not just figures it out, but actually is curious enough to try and figure it out. I’ve watched no less than 15 high school students look at the code and even say, “It’s one of those thingies.” My fear is we’ve schooled the curiosity out of them to the point where they can’t be bothered to figure out what it says….and I’m buying their lunch if they do. Once I get the student body use to seeing them around school, then I have all kinds of ideas of how I can engage them in learning activities outside of class time while they’re at school. Learning outside the classroom…..who would have thunk it? This reminds me a lot of the mid-90’s, when you started to see URLs all over the place. There’d be a full-page ad in Newsweek for, say, Chrysler. At the bottom of the page would be a little inconspicuous “http://www.chrysler.com”. It took a long time for people to figure out what that was and how to use it, and it took even longer for the advertisers to figure out how to capitalize on it. I’m still at the stage where I grab my phone every time I see a QR code, and scan it just to see what it is. I’m sure that novelty will wear off soon. The real problem, though, is that I need two devices to really use QR codes. If I’m reading your blog on my phone, I don’t have any way of scanning that code to see what it is. I have to read your blog on a computer (or another phone) and then use my phone’s camera to scan it and see what it is. That’s a lot more complicated than just clicking on a link. For helping to bridge the interface between the physical and digital worlds, it’s helpful. But for adding hypertext context to online resources, not so much. Great article. I’ve already started experimenting and I put a QR code in a staff magazine that asked them to put in their name and email address to show they’d scanned it … no takers yet! I’m going to put one in the school tomorrow with the offer of a free lunch to the first person who scans it and comes to me with a message. We’ll see how long that takes. Great post Jeff, I totally agree with your prediction and am currently working on some projects exploring their use. It includes links to several useful QR related tools and several posts from educators this side of the pond exploring their potential uses in the classroom. Created my first QR today after a speaker at GaETC mentioned creating them with the goo.gl URL shortener.I totally agree with you. I’ve been writing about QR Codes in education for the last five years (link to mlearning.edublogs.org), including a few published papers. While I was very interested in their potential when they were almost unheard of in the western hemisphere, I now believe they provide an interesting technology for the present day, but will rapidly be surplanted by visual searching (e.g. Google Goggles) and text recognition (both typeface and handwritten). The former technology allows mobile devices to visually “recognise” shapes of objects, logos, etc. taken with a mobile phone camera, and use that to retrieve information. This would ultimately free tagging from any single barcode standard, and allow physical objects to be tagged with ANY consistent visual symbol. Simultaneously, text recognition will allow retrieval or access to web-based activities or resources simply by typing or writing our a URL in human-readable form and pointing a mobile phone camera at that URL. This would completely bypass the need to create a QR Code in the first place, as well as having the advantage of knowing where your phone browser is taking you. A QR Code could, for example, lead to a hidden virus or phishing site, but its actual destination is obscured by its graphical, barcoded representation. I have to agree with Leonard. There are interesting things one can do with QR Codes, for sure, but I seriously doubt its going to rock the world of 2011. For one thing, they still remain IMHO clunky to use- you need good alignment and lighting to get a good enough photo to generate the URL. And all we are really doing is offering a gimmicky way to get a URL. I bet it would take less time to put up a URl that people might try out of curiosity if you just out a shortened URL printed on a piece of paper, its practically the same outcome. Using them also is premised on printing out, which calls for use of paper. The real frontier, as Leonard suggests, is visual search, apps that allows us to take a photo of a real object in the world to identify it and bring relevant info- as in SnapTell and of course Goggles- this is using your mobile in the real world to get info, not an abstraction to get a hyperlink. Hey but its all guessing, which is the fun. If QR Codes are a big hit this time next year, I’ll be happily wrong. I see your point, and I think we need to get innovative with them. Sure a URL might be easier to write down, but scanning it with a QR Reader saves that for later use. Also we need to get away thinking that they’re only hyperlinks. You can put other info in them as well. I do think there is a huge opportunity marking wise with these things as well. We’re thinking of putting the final testing schedule in a QR Code so kids can scan it and then have that information on their cell phone in their pocket. It won’t replace the other ways we hand out the schedule but will be just another way to get that information out to kids. Low level use? Yes. Worth it if one kid finds it helpful? Yes. I think you are right in that we’ll see tons more ‘out there’, but I see little value in education. I love your library idea… pretty cool, but all the other suggestions seem like one more step… You take something that is known and create an unidentifiable icon to represent it such that you need a device to tell you what you are looking at. Cool marketing idea, great for discounts and plugging events, but seems like an unnecessary step for most educational uses outside of a fun scavenger hunt. I see you’re point…and those two ideas where just baby steps to help teachers understand how they might be used. As much as I’d like to run full steam ahead into everything that is being discussed here we need to scaffold the learning of A) What is a QR code and B) What it does to those who are new. Like many things, I think we’ll see them pop up in our everyday life more in 2011 then we will in education. My hope in writing this post is that people will see them in their daily lives, think how they are being used and then think how that might apply to the classroom. What fun Jeff. Now, despite the doubters above, I can see a couple of pretty easy uses in a school setting after thinking about this for just a few hours. I’m putting one up on the front door of our school tomorrow – with a link to our school website (a wiki). And one outside my classroom door with a link to our classroom blog. Think there won’t be a few parents scanning and saving those important links to their phones? And I bet a few of them will have been unaware of those links before… I also put the images on those web sites… We’ll see if that goes anywhere. Great idea Mark! Fun stuff and I think you’re right. There are other ways to get the info out and this is just another way to get it into the pockets of people and on their cell phone which they have with them all the time. Here’s a suggestion: Use goo.gl or bit.ly to create a short URL and then use that URL to make the QR Code. Both services track the number of clicks so you can have some data on just how many people are clicking and using the QR Codes. This is an awesom post and lots of technology. Whoever said that mobile phones have no place in the classroom should read this post. Keep up the good work and thanks for the reading material. Hey Jeff, love the blog and completely agree that in 2011 we will see QR Codes blow up. The possibilities of what they can do with mobile coupons is very exciting. Come download a free scanner and checkout more about QR Codes at http://www.scanlutions.com. Whoa. I am about to do this right now. I write a daily children’s poetry blog, and it just may be time to post mysterious questions along with QR codes around town…hmmm…thank you! A.
I wonder when elementary students will be able to access all of the mobile technology that’s out there. Elementary kids don’t have the cell phones to do this kind of stuff. Yet. I think it’s going to be a while. Oh, and TAGs are color and can accommodate some very cool design features. Or you can render plain old black & white ones. your choice. Great post Jeff and good to see people are looking at how they can be used beyond just having a url link. They’re a great way to get extra information to people – even to take payments! Re: QR vs. TAG, the problem with TAGs is that you must have an internet connection for them to work, the good thing is they do work at much smaller sizes. Let’s see what happens! I can tell that QR codes have gained popularity recently. But as others mentioned, image recognition is going to surpass the use of QR codes since there is no need to generate a code and find placements for them. Any type of QR codes/barcodes are intrusive and distracting. It may seem fun now but would you buy a magazine or catalog full of these codes? Wouldn’t it make more sense to learn about the Mona Lisa by “scanning” an image of the painting rather than of boxes and lines? Jeff – Thanks for this great post. I love that they can contain more information than just a URL – as I thought the depth of them was. I am starting a new job next year as an Information Skills teacher (IT teacher) based out of the library. I will be implementing the student book review idea. I’ve just been nominated for Microsoft UK Innovative Educators Award for my using QR codes to stimulate oral storytelling in primary school. I’m not so sure it’s a matter of having “schooled the curiosity out of them” as it is them being more marketing-savvy and marketing-resistant than any generation before. Because really, if you see some completely unlabeled QR code, isn’t it very likely to be an ad for something you’re not interested in? Why waste your time just to be exposed to yet another ad? I don’t have a smartphone yet, but I’m likely to break down and get one soon—and when I do, while I could see scanning a QR code that has a caption or something to suggest why I might be interested in it, I can’t imagine scanning a QR code with no further information. Why scan something that is 99% likely to be an ad? Yes, maybe one time out of a hundred I’ll miss the opportunity for a free lunch from a social researcher, but I think I can live with that. Good point….hadn’t thought about it that way. I’ll try the experiment again this time with a caption that says. “Figure out how to read this and win a free lunch.” Well see what happens. I think you are right on! After reading this post I have noticed QR codes on magazines, the Verizon store, billboards, they are everywhere! Jeff, I really like this post a lot. Not only because I think it’s probably right on point (I need to contact you to help me with my sport betting errr predicting) but because in addition to giving examples of where QR Codes are popping up, you give some great ideas for classroom use. As a teacher who tries to incorporate as much technology into classroom learning as possible and as someone responsible for my district’s ed tech training, thank you very much. Jeff, I was at your workshop at the EARCOS leadership conference and ran your experiment at my school; I put one QR code in the high school area and one in a teachers’ area. After two weeks, I have had no response from the students, but one of our primary level teachers came to claim the prize within 1 day of posting! Thanks for the feedback! Why do you think kids aren’t engaging with the QR Code. One comment talks about kids are so use to advertisements that they just tune them out? Maybe….I had to give a hint to students in our HS about the first one. But the MS students figured it out in about two days time. I am so happy to have found your article today. It will be fun to incorporate even more QR code lessons into my teaching. Thanks for all of the info! Fantastic idea! 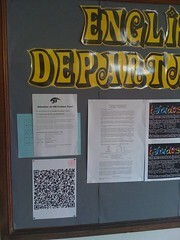 Love that people continue to share how they are using QR Codes with students. Keeps giving me ideas on more ways to use them at my own school. To by pass the issue of needing a smart phone I started beta testing decodeforme.com it scans mms messages/emails for images, decodes a QR code if found and sends it back to the sender. It’s still a little buggy as I don’t have access to test phones for all of the carriers. If any one is interested in Beta testing let me know. I am still trying to figure out a way to make money from it to offset the cost of running it. Any Ideas would be appreciated. Nice approach and thinking of QR codes. We think the service has great potential and for that we have enhanced it with social features for Facebook, Twitter, YouTube, etc. users. I did a test a few months ago where I put a QR code on our IT Office door telling students to come in and tell us the magic word (given in the code) and they would receive a prize (Coffee Beanery coupons) It took them less than 2 hours and considering class changing times, etc. I was impressed. The funniest part was listening in to the conversations outside the door:-) In the end it took a few students working together to figure out how to read the code properly. It is a bit gimmicky really, but in the end if they only learn about the QR code technology it is worth it. I can see this leading to a discussion of global business, how packages are tracked or inventory is kept in the Kia car factory, etc. I despise QR Codes- absolutely despise them. Here is why, they are a monumental waste of time and resources. If I am reading a newspaper article that I am finding interesting, why would I want to scan a barcode to go on the internet to learn more? If the information was that important, I should have found it in the newspaper with the story. I don’t care about learning more about my deit pepsi online. If I am reading a book, I really don’t want to have to put it down and find something online. Either it is important enough to included or it is not. If somebody is that interested in a story or subject they should be intelligent enough to go find more about it online. Moreover, I think they are a terrible idea in the classrom. I’m sorry, call me old fashioned, but phones in school are a distraction. If they are too distracting to use while you drive, certainly they must be too distracting to use while you learn. If your french teacher wants to label things, they should label with a lable not a QR Code which isn’t going to exclude any of the students. I’m sure I am in the minority on this, but there is another side to QR Codes. All the grade 5 teachers in my school have their daily schedule online, and this is linked to a QR code on our doors. When admission are taking prospective parents around, they say “Let’s see what’s happening in 5C today” then scan the QR with an iphone or ipad and hand it to the parents. Most of the daily lessons are also linked to online work. Parents love it! Looks very impressive! QR codes have amazing potential. Make the wall of your school talk. So much of our learning is digital. We use QR codes to make our learning visible to parents and visitors. These codes enable others to see and hear what we’re doing in classrooms – projects, reflections, strategies, etc. it all becomes visible when a parent scans a QR code in the hallway.